Heat the oil in a large Dutch oven; add eggplant and onions. 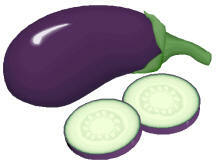 Cover and cook over medium heat, stirring frequently, until eggplant is very soft and lightly browned. (approximately 25 minutes) Add the garlic and green pepper and cook, stirring for two minutes. Drain tomatoes, reserving the liquid; cut tomatoes into pieces and add to eggplant mixture along with tomato liquid, sugar, and basil. Cover and simmer, stirring occasionally, for 15 minutes. Add the parsley, olives, and pimientos; simmer uncovered, stirring, until sauce is thick, about 20 minutes more. Add salt and pepper to taste.